1. Congratulations CATE 2016 award recipients! The CATE Executive Committee would like to congratulate Dr. Deborah Britzman, 2016 recipient. Deborah Britzman is Distinguished Professor of Research at York University in Toronto, Fellow of the Royal Society of Canada, and psychoanalyst, with a small private practice. Prior to her doctoral work, Britzman taught secondary high school English and reading for five years in Hartford, Conn. She holds her doctorate degree from the University of Massachusetts (1985), taught at the State University of New York (Binghamton) for six years, and then in 1993, to Canada to assume a Faculty position at York University. She is a member of the Faculty of Education and holds numerous graduate cross appointments. Britzman is author of nine books, seven of which address the field of psychoanalysis and education. Her most recent books are, The Very Thought of Education: Psychoanalysis and the Impossible Professions (SUNY Press, 2009); Freud and Education (with Routledge, 2011); A Psychoanalyst in the Classroom (2015, SUNY Press); and Melanie Klein: Early Analysis, Play and the Question of Freedom (Springer 2016). Since 1986, Britzman has authored over 100 articles and book chapters. Britzman’s current research involves studies in mental health with an emphasis on the emotional world of affecting education. Highlighted are literary, clinical, historical, and narrative representations of the education and practices of teachers, professors, students and psychoanalysts. Her most cited book remains, Practice Makes Practice: A Critical Study of Learning to teach (2nd edition 2003, with SUNY Press). Please join us at the CATE/ACFE AGM to honour Dr. Britzman and to hear her remarks. Please visit our Awards page to learn about each recipient’s research, and be sure to attend the CATE/ACFE AGM (more information below) to meet these up-and-coming teacher education scholars! Thank you also to our 2016 Book Donors who help us in recognizing award winners. The following positions will be open for nomination and election at the 2016 CATE/CAFE AGM. Please consult the position descriptions on our website. Michele Jacobsen is a Professor and the Associate Dean, Graduate Programs in Education, Werklund School of Education, University of Calgary. As Associate Dean, Michele provides academic leadership for research and professional graduate programs in educational research and educational psychology that serve over 1200 students. Michele works closely with an excellent team, including GPE administrators, academic faculty members, doctoral and masters students, to engage in and support high quality research and scholarship in blended and fully online learning environments. Michele’s own research program has focused on technology-enabled learning and teaching in K-12 classrooms, schools, school jurisdictions and post-secondary contexts using case study and design-based approaches to research. Michele examines and creates innovative designs for teaching and learning that shift instruction from standardized delivery and testing to participatory pedagogies in technology enabled learning environments that sponsor knowledge building, intellectual engagement and assessment for learning. Michele also studies research ethics, policy and guidelines to inform Internet and indigenous research methodologies. 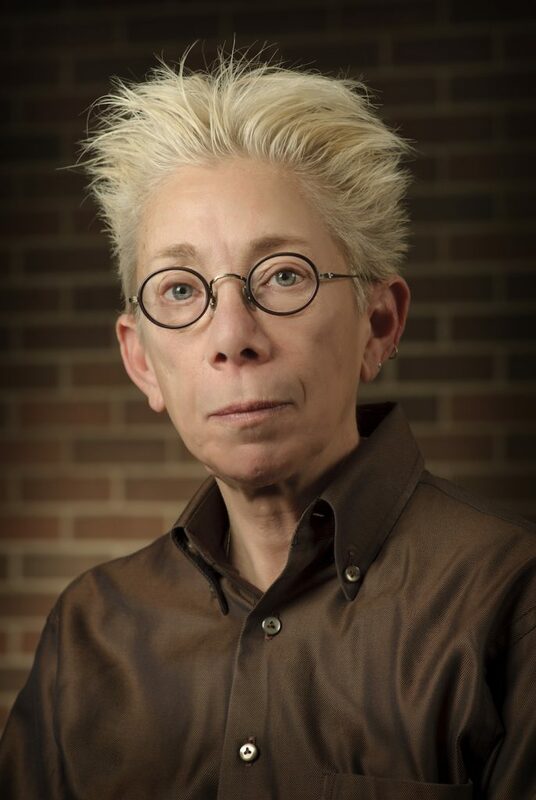 Michele has been actively involved in CATE since 1996, first as a doctoral student and then as a faculty member, and in a variety of ways, from presenter, discussant, peer reviewer, award nominator and as a graduate supervisor. As a thriving association of the Canadian Society for the Study of Education (CSSE), Canadian Association for Teacher Education (CATE) is a pan-Canadian community of scholars who hold deep expertise and diverse knowledge about teacher education. As Vice-President of CATE, Michele commits to active engagement with our national network of CATE members, graduate students and the CATE Executive to promote dialogue, research and collaboration on teacher education, and to build and extend upon present initiatives that mobilize knowledge and innovations arising from our collective research and scholarship and to expand upon the fine tradition of recognizing excellence through the CATE awards program. Dr. Nancy Maynes has been teaching at Nipissing University in the Schulich School of Education for the last 10 years, after a career in the public school system as a teacher, consultant, coordinator, vice-principal, and principal. She has been involved as a member of CATE for all of the time she has taught at Nipissing, and has served on CATE committees and as a co-editor of a recent book about teacher hiring across Canada, for the CATE Polygraph series. Nancy has served as secretary/treasurer for several organizations and has been secretary of the Faculty Council within the Schulich School of Education. Nancy is also a small business owner and is familiar with accounting practices that can be applied to the Treasurer’s role in this position. Leyton Schnellert is an Assistant Professor in the Faculty of Education at The University of British Columbia – Okanagan. His scholarship takes up teacher professional development. More specifically, Leyton’s research attends to how teachers and teaching and learners and learning can mindfully embrace student diversity, inclusive education, self- and co-regulation and pedagogical practices that draw from students’ and teachers’ funds of knowledge to build participatory, collaborative, and culturally responsive learning communities. Leyton is the Pedagogy and Participation research cluster lead in UBCO’s Institute for Community Engaged Research and co-chair of British Columbia’s Rural Education Advisory Committee. Leyton is interested in service that brings diverse perspectives together to explore commons interests, opportunities and challenges. The MAL role in co-coordinating the CATE pre-conference seems a good fit and an excellent opportunity to engage in scholarly, action-oriented explorations that bridge pre-service and inservice education. I have been a faculty member in the School of Education at Thompson Rivers University since 2001. I have attended two CATE working conferences and have contributed two chapters to the CATE journals. I am on sabbatical for one year starting July 1, 2016, thus I am able to serve the CATE executive when I need a break from writing my doctoral dissertation! In 2015, I was charged with coordinating the BC Teacher Education Roundtable hosted at TRU. The Roundtable is an annual conference where teacher educators from across the province meet to discuss current practices, changing policy, and share insights about emerging trends and challenges. As the Roundtable Coordinator, I chaired a committee of ten helpful organizers and was responsible for for overseeing the following tasks: booking the key note speaker and entertainment for the evening social, organizing paperless distribution of information and registration procedure, designing the schedule for the two day event, including room bookings, catering, accommodations, and workshop facilitators for four breakout sessions, and carrying out the MC duties for the evening social and workshop day. The theme of the conference was Indigenizing Teacher Education and 115 teacher educators were in attendance. Next year’s CSSE will be located at Ryerson University in Toronto, Ontario. I was born and raised in Toronto and I know the city well. My experience in coordinating the Teacher Education Roundtable combined with my excellent organizational and communication skills make me an excellent candidate to support the CATE executive in carrying out their responsibilities. I am a third year PhD candidate at the Faculty of Education, Queen’s University. My doctoral research focuses on early years teaching and learning, with a specific interest in supporting student thriving in the Ontario Kindergarten classroom. As a researcher and project manager for the Social Program Evaluation Group, I have experience working as part of a team, communicating with multiple stakeholders, and implementing externally funded research projects. My service experience includes co-founding the Education Students’ Mental Health Initiative, organizing academic events (such as graduate student presentations and guest speakers), and helping to coordinate Rosa Bruno-Jofre Symposium in Education as the PhD student representative. All nominations should be sent to CATE/ACFE President Julie Mueller as soon as possible. The 2016 schedule of CATE events in Calgary is downloadable here in a convenient PDF. and is Vice Dean of Werklund School of Education, University of Calgary. of teacher education, teacher education programs, and individual institutional experiences. Agenda, executive reports and the 2015 AGM minutes are available here. Please take a moment to review them prior to the AGM. Please consider donating a recent book for our annual book display at the AGM. Each year at the CATE/ACFE Annual General Meeting, we display, promote, and celebrate resources and information that would be of value to Canadian teacher educators. For this purpose we put on a book display with recent publications in teacher education that may be of interest to our membership, prior to and during our AGM. At the close of the meeting, the books are given as prizes to graduate students who are the recipients of awards for their work in teacher education. If you or a colleague has recently published a book or series related to teacher education and would like to donate a copy or two of that work to CATE for the purpose above, please contact Julie Mueller. Thank you for your time and consideration in furthering the work of Canadian teacher educators. Dinner sign-up is available here. For more information, contact Jodi Nickel. What are the impacts of neoliberalism on your institution, your teacher education programs, and your own work? What are your responses (individually and collectively) in your research and at your institution to neoliberal influences? Please RSVP by email to one of the CATE/ACFE Members-at-Large (Manu Sharma, Kathy Sanford or Nathalie Pender). Lunch will be provided at a nominal cost. We are excited to delve into deep conversation with you soon! In this professional development session, we will discuss the process of publishing in academic journals. Drawing on our experiences as authors/editors of peer-reviewed journals, we will share lessons learned on the publishing/editing process and address a number of questions that might be of interest to emerging scholars. What do we need to know while preparing a manuscript? How can we choose an appropriate journal for the manuscript? What happens to the manuscript after we submit it to the journal? We will also discuss some common reasons why manuscripts are not accepted for publication in refereed journals. This session is designed to be highly interactive, and we will focus primarily on the questions, concerns, and ideas that the attendees bring with them. We hope to give graduate students tangible skills and knowledge to embark on the process of getting their work published while pursuing their degree. Dates will be announced with the full program in the early spring. Organized by CATE/ACFE Graduate Student Representatives. My name is Nathalie Pender and as a member of the executive of CATE, I have been mandated to organize a constructive discussion on the place of research in French, its difficulties, and the possible solutions to remediate them during the next congress in Calgary. I am inviting all CATE members to help me determine the topics of this discussion. Yours answers to the following questions and the work currently done by CSSE and CATE will allow us to organize a discussion based on your interests and opinions. As Francophone researchers, we publish in French or in English. Is this by choice or by necessity? Is it possible to do research in French in Canada? What are your own questions? I hope to meet you in Calgary to continue this discussion. Thank you for your help. In response to our first CATE/ACFE Town Hall on International Education held last year in Ottawa following CATE members’ participation in the International Summit on the Teaching Profession, we are planning a second town hall style event this year in Calgary to open discussion related to teacher education from a global perspective. This year the discussion will examine the power of education and the role of teacher education in international contexts. Add this opportunity to participate in provocative discussion and debate with peers and colleagues, to your Calgary plans! Are we admitting the right teacher candidates? For decades, teacher education programs have struggled to identify the most effective and efficient processes to admit teacher candidates (TC’s) who have the strongest likelihood of success in the program and the profession. This panel will discuss the types of “non-academic” admissions criteria and processes that are in use across the country including approaches increasingly used by other professional programs to assess critical professional skills such as collaboration, ethical decision-making, self-awareness, sense of responsibility, cultural sensitivity, communication, empathy and problem solving. The CAARE executive warmly welcomes you to attend our events and become a member of CAARE. We look forward to seeing you! CAARE will be hosting a book launch on May 30, 2016 (12:15-1:15pm) featuring current and influential action research work. This will be followed by our annual general meeting (1:30-2:45pm) with light snacks! 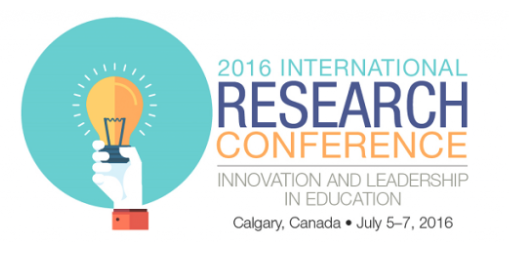 CAARE will also be featuring a keynote panel on June 1 (11:15-1:15pm) that discusses what action research projects can look like in a school and university setting. The panelists will draw upon their current roles to explain how they are involved in doing action research and how it has impacted the field of action research in education. 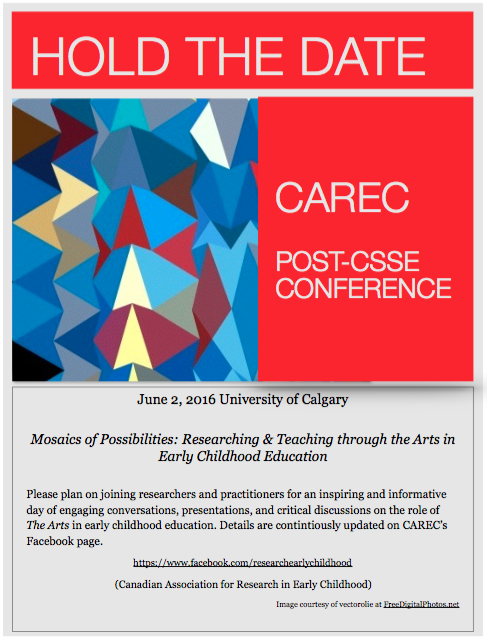 Please plan on joining researchers and practitioners for an inspiring and informative day of engaging conversations, presentations, and critical discussions on the role of The Arts in early childhood education. Details are continiously updated on CAREC’s Facebook page. The CAREC AGM will be held during the lunch break on Wednesday June 1st (light refreshments will be available-room location TBA). The election of a new SIG President will occur during the AGM so please plan on joining us. Information regarding the position and nomination process can be obtained from Debra Harwood. Galileo Educational Network (galileo.org), in the Werklund School of Education at the University of Calgary, creates promotes and disseminates innovative teaching, learning and leadership practices through research, professional learning and fostering collaboration across Canada both onsite and online. Presenters will share how students, teachers, administrators and faculty members are engaged in leading and learning, improvement and innovation and research and development. Six principles foundational to the work include: (1) stewarding the intellect through discipline-based inquiry; (2) infusing digital technologies; (3) providing high-quality assessment; (4) honoring collaboration and teamwork; (5) fostering scholarship of teaching and (6) providing practical, thought-provoking preparation for pre-service teachers. Using design-based professional learning strategies and design-based approaches to research serve to continually inform both theory and practice. A professional learning and research project focussing on STEM designs for learning will be highlighted as a current example of collaborative work with faculty members, Partner Research Schools and Galileo mentors and consultants. The TATE SIG will then be hosting a dinner at Jameson’s Irish Pub at 3790 Brentwood Road NW (just across Crowchild Trail from the University of Calgary) at 6pm on Saturday May 28th. Please email Norm Vaughan if you would like to attend. Teacher Learning and Professional Development (TLPD) is an open-access, peer-reviewed journal that is broadly concerned with the challenges and complexities of learning to teach. We frame learning to teach as a lifelong process that includes formal pre-service and continuing education programs for teachers and a variety of informal experiences that contribute to teachers’ professional knowledge. We also recognize that the term teacher is typically taken to refer those who work as elementary or secondary school teachers; however, we adopt an holistic definition of teacher learning and professional development that includes the learning and development activities of anyone who teaches or self-identifies as a teacher. This expanded definition thus includes, but is not limited to, K-12 teachers, post-secondary teachers, adult educators, museum educators, community-based educators, coaches, and performing arts teachers. The journal welcomes research papers that shed light on issues in teacher education and professional development from a variety of methodological approaches and disciplinary lenses. Teacher Learning and Professional Development is the official journal of the Institute for Studies in Teacher Education at Simon Fraser University. Please enjoy the first issue and feel free to email Shawn Bullock with any queries. The Innovation and Leadership in Education International Conference, sponsored by Kappa Delta Pi and Mount Royal University, will focus on leadership for professional growth and educational innovation. This unique event will bring together educational researchers, education experts, teachers, educational administrators, undergraduate students, and graduate students who have theoretical and practical knowledge of the education of children and adults. The confirmed keynote speakers are Kenneth Zeichner and Gloria Ladson-Billings. Please visit our conference website. CATE/ACFE members are welcome to submit announcements for the next issue of the newsletter. Many thanks to those who contributed to this edition!